Welcome to the home of LEYNOSK, as a child I always wanted a dog and would walk anybody’s dog if they’d let me, ranging from toys to cross breeds to Afghans , after many years of trying to persuade my mum and dad for a dog we eventually were lucky enough to aquire “Brandy” our black labrador, who was our family dog but it was myself who generally trained and walked her. It would be several years later before i would have another dog, a German Shepherd called “Skye”, whom my partner at the time very kindly bought me after pestering him for months, she was perfect and I was set to convert everyone I met about their bad publicity and succeeded. I had Shepherds for the next 30 years, all as friendly and outgoing as Skye and all of which had excellent Health Clearances. Then one day I woke up and thought to myself “you’re getting old” and this beautiful breed is not what it was, “So” it was time to have a “Golden” my second all time favourite breed, “Summer” was beautiful but unfortunately had a hip score of 50, MRD and Entropion, after breeding Shepherds with excellent health clearances, I wasn’t about to breed from her, even with encouragement from others, SO she went back to the less than supportive breeder, and that’s putting it politely. 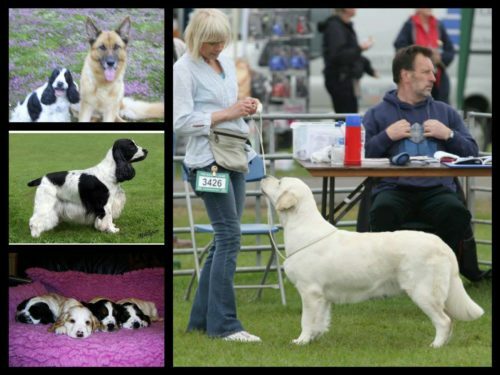 For the next 11 years I attended shows, got hands on, studied pedigrees and oddly enough everything I liked always went back to the same dog, Sh.Ch. “Shardanell Castaspell”.